Please read carefully before you begin. This process cannot be undone! What does "cloning" a location mean? The cloning process means taking the inventory information that exists at one location and replicating that information into a second location. For instance, if I have just opened up a second store and sell all the same inventory, rather than having to create the inventory for Location 2 from scratch, I can simply copy the inventory information in Location 1 into Location 2. Once the cloning process is complete, the inventory entries are independent of each other. So selling a Product at Location 1 will not affect that Product's quantity at Location 2 and vice-versa! 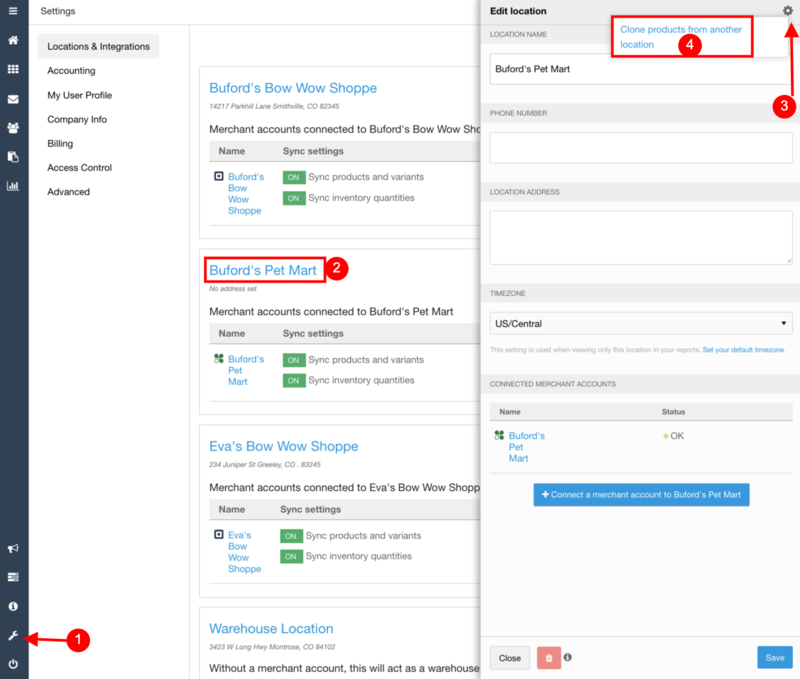 The process starts in the Locations and Integrations tab in the Settings section of Shopventory. Source location is the Location whose inventory you wish to clone (Location 1 in the diagram above). So, if I want Location 2 to have the exact same list of inventory as Location 1, I would select Location 1 as my source location. Taxes are the tax rates you want carried over. NOTE: The tax rate must already be created and active for the new location to which the inventory is being cloned. Quantities are optional and usually not recommended. The default is set to "No." This just means that all the cloned Products will have quantities of zero for you to update. If you select "Yes," then this location will have the exact same stock counts as the source location. Once you choose all your options, hit the Clone Products button. Again, this will take the inventory information currently in the source location and clone it to the location you selected. IMPORTANT: Cloning your Products does not automatically sync them to any integrations at the new location. To sync all Products to your POS, follow this guide to Exporting to an Integration.